The worldwide retail industry has lost not only a top visionary and a creative genius, but also a wonderful human being – Steve Jobs, the co-founder of Apple. 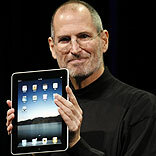 Steve Jobs (1955-2011) was battling pancreatic cancer since 2004. The loss is irreplaceable and is being mourned by millions across the world. The man whose ideation and thought leadership brought to us devices like iPad and iPhone, the innovator has surely left behind a legacy. He did what a true innovator could have done – transforming discretionary items into necessities. While tech fanatics the world over are remembering Steve for his grand innovations in the realm of technology, his priceless contribution to the retail industry must not be forgotten as well. Apple retail stores, having recently celebrated their 10th anniversary, have come to become one of the most renowned stores the world over. These stores are marked by true “apple experience” that has apple’s signature style of displaying gadgets on broad tables, the “Genius Bar” for solving customers’ problems, fluorescent advertisements for the latest launch, intelligent sales person, etc. The “apple experience” has revolutionised retail concept. Be it the sale figures that these stores attract on a daily basis or for the kind of quality products they deliver, the response and brand loyalty has been phenomenal. Steve has been an inspiration to other retailers. Not to forget that Apple has set a trend for various technology playes across the globe, by venturing into the brick & mortar format of selling products. The stores are experiential which explains the devoted following that the brand boasts of today. Such has been the influence of Apple’s store design and conceptualising involved that other prominent retailers are also eyeing the same in order to offer an all together different experience to their customers. Apple’s various gadgets have helped bring mall shopping into the 21st century. The move has marked the beginning of an era of smartphones and tablets that has grown to be a competitive and cluttered field, enhancing the customer experience like never before. We only take for granted, the great technology driven products which are the actual creation of a genius – Steve Jobs, the man who will be remembered by generations to come.